In July 2011, the world celebrated the independence of South Sudan after a 22-year civil war. But bombs had been falling for weeks across the Sudanese border in South Kordofan, where rebels who had fought for the new nation felt their state had been left stranded in the wrong country. Four years later, if Sudan makes the news, it's usually because of the civil war in South Sudan where between 50,000 and 100,000 people have died in 18 months of conflict. By comparison, South Kordofan's death toll of 4,500 seems insignificant, but the rebels and the people of the Nuba Mountains fear Khartoum won't stop until they are all driven out. Welcome to the Nuba Mountains region of Sudan’s South Kordofan state, where a long-oppressed and largely forgotten minority is refusing to be driven away. Read more. It was on two of the last days of April 2014 that Tom Catena heard what sounded like a lawnmower and saw what looked like a giant model aeroplane in the sky. Read more. This is the story of Amal, whose village was attacked in April 2014. Amal tells of conflict in Sudan. 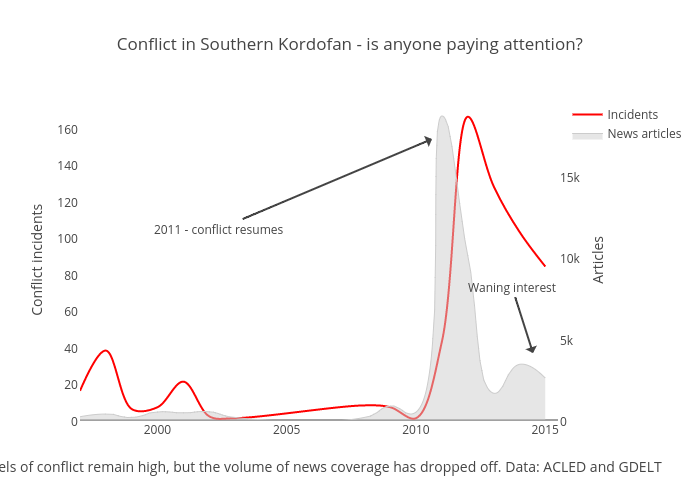 The graph below shows a massive spike in media attention after conflict erupted again in South Kordofan in June 2011. It also shows just how short that attention span was. There was no let-up in violence to merit the rapid decline in interest. In fact, since December, the conflict has been more intense than ever.